Extremely rare and stunning antiqued silver plated table lamp with unusual and original "Ceonix" conical shade by WAS Benson c1905. An imposing approx 23" height overall. 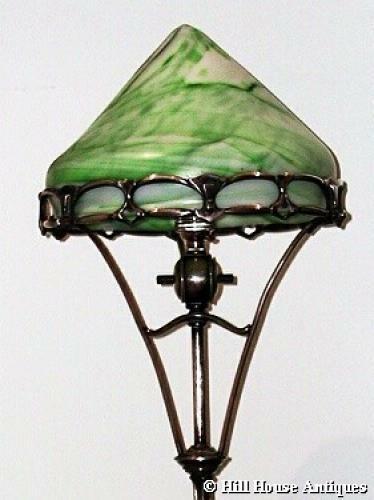 Benson used this type of finish and styling on some of his candlesticks, tazzas and comports as well as one of his mantel clocks, very much in the Art Nouveau style. Interestingly, the intricate latticework gallery design surrounding and holding the shade is similar to the patented window frame designs he executed. Small heart shaped piercings to the above latticework as well. Incised marks to top of base.